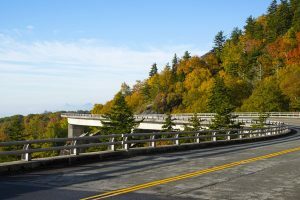 Check out this great information on the Linn Cove Viaduct from www.blueridgeparkway.org. The Linn Cove Viaduct hugs the face of Grandfather Mountain and is recognized internationally as an engineering marvel. This was the last section of the Parkway to be completed and a model of the construction technique highlights a visit to the Linn Cove Visitor Center.